We don't care what everyone keeps saying.They're talking about how white is the new black, blue, pink, orange, it's all wrong! Black is classic and as a result it is very classy. It leaves people who wear it looking very mysterious and, with a good haircut, they look suave as heck. These are the guys who walk into any gathering and, even if they're not on the list, THEY'RE ON THE LIST. These guys are the smoothest wedding crashers, club goers, and they know how to get into the VIP lounges in every single club. They're definitely the ones you want to be friends with. They're always the ones who might have to duck out early in fear of getting too much attention from the ladies! 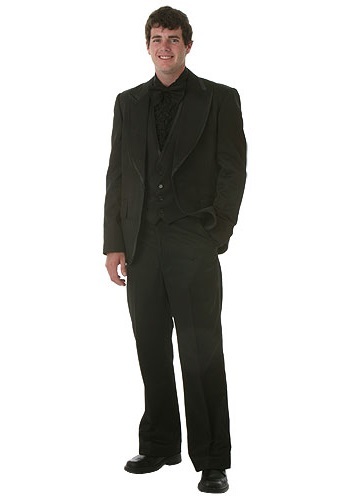 You'll be "puttin' on the Ritz" in our Men's Black Tuxedo! It's a classic look that's great for any black-tie event. Make it even spiffier by adding black shoes, a cane and top hat! Don't forget to bring the gang all together with our other tuxedos in some pretty sweet colors! Some of them are a little braver than the black one but you've got a conversation piece there like no other while with the black suit you'll blend right in and work your moves from there. You can lead the charge with the classic black tux and make every night you go out legendary!